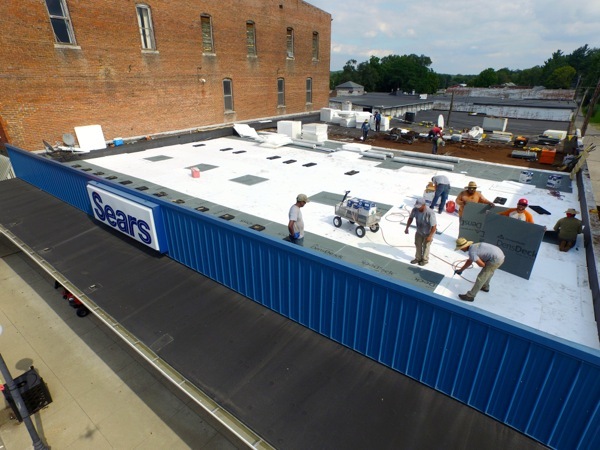 The home town Sear’s Store located at 247 E Walnut Street in North Vernon, Indiana had reached a critical point in the store’s flat roof. The building’s flat roof had leaked on and off for several years but now the leaks had grown more severe and had begun to damage merchandise. The buckets to collect the steady drips of water and tarps draped from the ceiling were making the store look unkept and cluttered. The building owner knew that he was in jeopardy of losing a great renter if he didn’t have the flat roof repaired. That’s when he reached out to Exterior Pro for free evaluation and summary of roof repair options along with budgets so he could make a decision about which route would be best for his building and financial situation. The existing roof that was leaking so much wasn't just one layer of flat roofing but actually three! The structure was built in the 1950s and the original roof was a tar and gravel style, commonly found in southern Indiana during that time period. 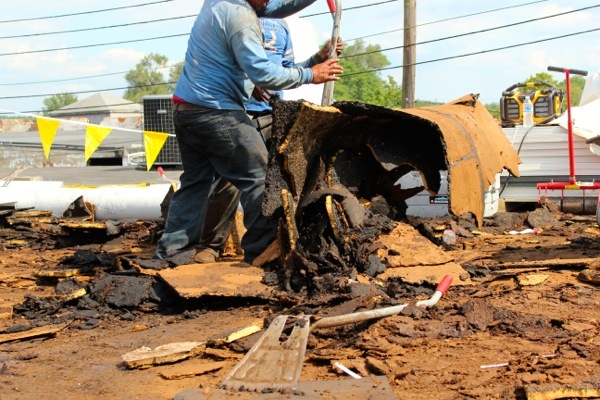 The second roof was approximately three inches of a spray foam roof and the third roof was an EPDM rubber roof. Amazingly the old flat roofing materials had never been removed so each layer had absorbed as much water as it could hold. All three roofs were completely saturated with water. Why so many leaks with three roofs in place? The 8,000 sq. ft building had only two drains located near the back of the rectangular design. The structure had no fall or pitch to it what so ever and it had even sagged over the years holding water. This ponding water seeped its way into all three roofs and had soaked them over the years. Not every leaking flat roof must be torn off. Flat roofs that are not saturated with water and that do not already have two roofs can be laid over or recovered without problem. However, the North Vernon Sears Store had three roofs and all three were saturated with moisture. The old roofs had to go. Exterior Pro Roofing completes several medium and large scale flat roofing tear offs each year but we had never seen one like this. It took a ten men crew four long tough days to remove the old roofing and install the new flat roof. We filled dumpster after dumpster of old, smelly, saturated, and heavy roofing debris to the tune of 97,000 thousand pounds! Divide that by the square footage the building and you’re talking about almost 13 pounds per sq. ft is what the old roofing weighed. The entire crew agreed that the older building must be breathing a sigh of relief as we removed the heavy load from its back. The dirty, tough tear off wasn't the end of the story, it was only the beginning. Exterior Pro now set out to install a new flat roof system that could with stand foot traffic, keep the building completely dry, and do so for the next 20 years. with little or no maintenance. We also had to make sure that the flat roof had some pitch or fall so that the water didn't just stand but flowed to the drains. Tapered roofing insulation is a ridge, 4’ x 4’ piece of insulation created with a slant or slope built in and can be used to direct water to a gutter, scupper, or roof drain. The issue with the North Vernon Sears was that the roof drains were almost 80’ from the front of the building. It was going to take a lot of tapered roof insulation to move water that far but it had to be done. In order to “drive” water to the roof drains we had to build a small mountain of roofing insulation on the Sears. It took multiple layers of tapered insulation to make it happen but we did it. We began at the front of the store with 13 1/2 inches and ran to the drains some 80’ away ending with only a 1/2 “ over our new base layer of insulation. We then covered all the new roof insulation with Dense Deck Prime. 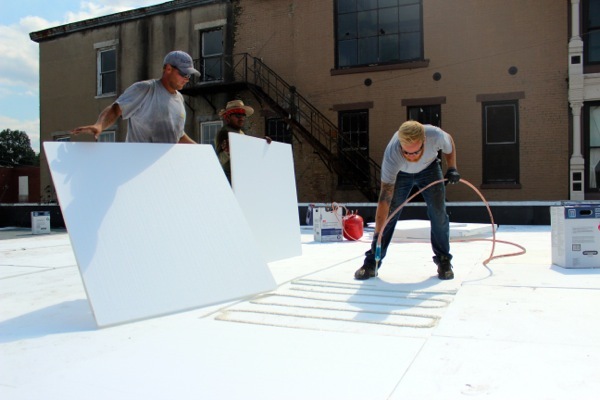 Dense deck prime is a board used to glue down roofing projects because of its superior adhesion and ability to stick to new roofing membranes. After all the tear off, clean up, and new roofing insulation was installed, the Sear’s was prepped and ready to receive the new flat roofing membrane. 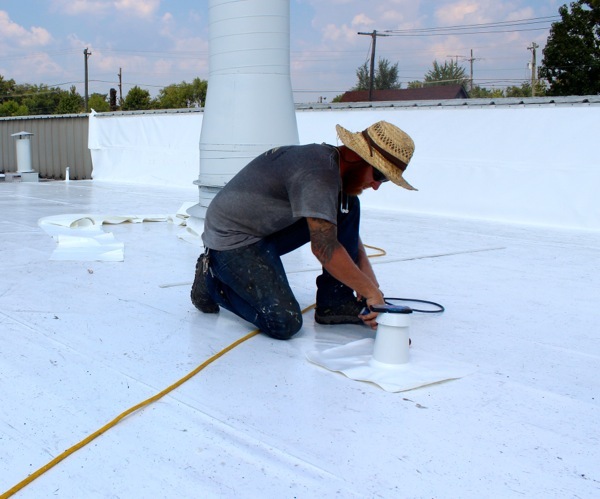 For this project we used a white PVC (polyvinyl chloride) roofing membrane with a 60 mil thickness. We used a solvent based adhesive to glue it down and after re-flashing the drains the roof was rain ready. The North Vernon home town Sear’s never had to shut down or close its doors during the entire re-roofing process. Exterior Pro really goes out of their way to make sure the business they work at can stay functional and operational all the way through construction. 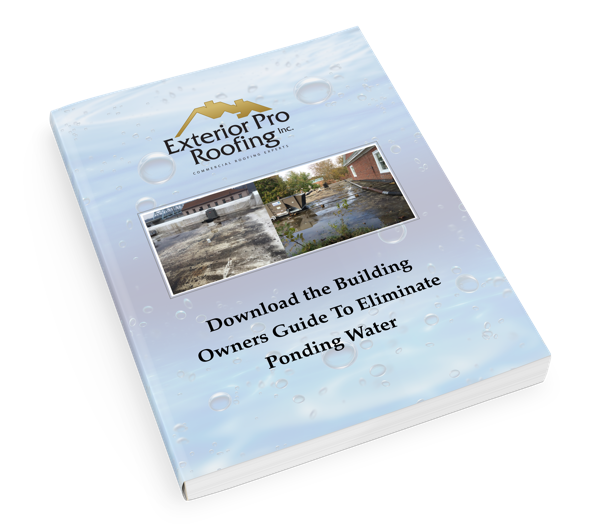 Learn the reasons why ponding water happens & learn how tapered ISO can eliminate and prevent ponding water on flat roofs.